I’m not going to post much tonight. I’m tired and kind of blue about heading back north of the border…not to mention having my camera die. Some people think it may come back if I put it in rice, so I will give it a try. I will post more when I get back and get my pictures organized . I have pros and cons about the places I have stayed and will post those when I collect my thoughts. Living through Hurricane Ernesto wasn’t that bad. I fell asleep at about 10:30 when I learned that none of my neighbors were going to evacuate. I woke up at about 3:45 to the same sounds of rain and wind that I fell asleep to. The electricity and internet were working, however, so I just went back to sleep. Today was still extremely windy…so much so that you really couldn’t do anything on the beach. A few people went swimming, but there were no boats or snorkelers. When I went out to the beach this morning, I expected a big mess but it really wasn’t that bad. Mostly seaweed and some plastic trash like bottles, etc. My neighbors told me that the winds only got to about 35 kilometers per hour, so that wasn’t much…although to me as a newbie to hurricanes, it was pretty noisy. My thinking was that if they weren’t going to worry…I wasn’t going to worry. All in all, it was a good trip. I definitely would have done some things differently and I will explain those in the next few days. I will end this on a shot I got of the beach south of Akumal Bay before my camera died. This beach is amazing and clean and blue…and reminds me of Playa Norte on Isla Mujeres. Do you think these logs just really appear on the beach?? Or does someone put them there? 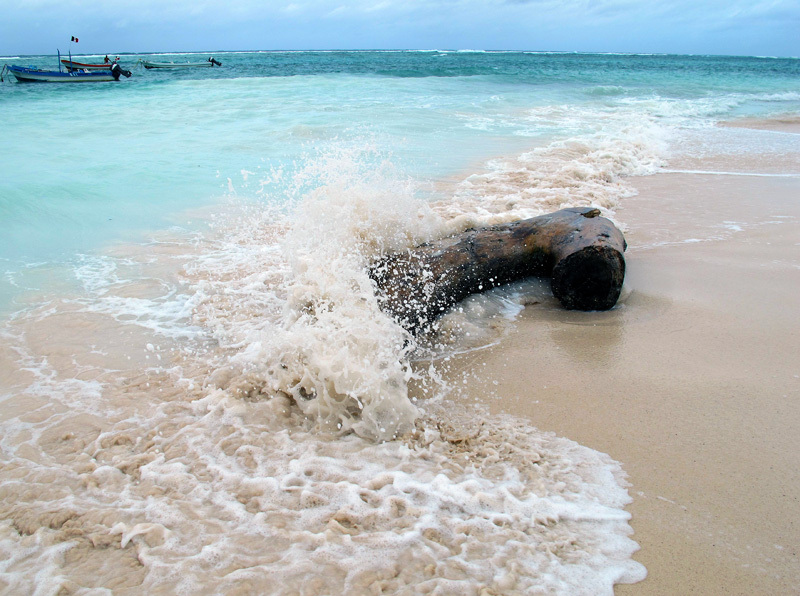 Either way…I wonder how long this log has been floating in the sea. This entry was posted on August 9, 2012 by EditorDeb. It was filed under Uncategorized . I’ll be anxious to hear what you thought of Akumal. I’m thinking that might be a good destination for a future trip. Gorgeous shot of the beach there! Everyone I know that has gone to Akumal has liked it–not during a bad storm, though! Things could have been a lot worse so I’m glad the storm was not a bad one. Too bad about the camera–hope the rice works! Safe travels, we’ll look forward to your next trip and future postings! Gracias!